A few days ago I created these Bootstrap 4 Carousel templates and then I wrote a tutorial about different ways to disable the autoplay feature. 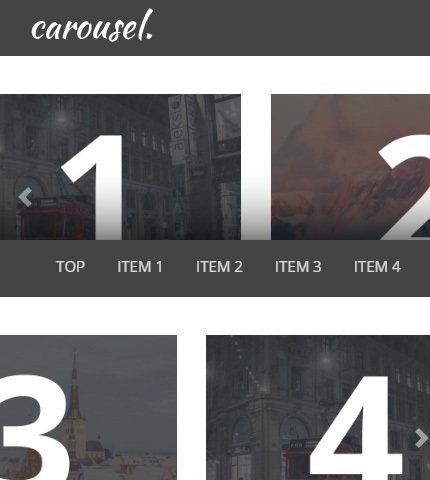 Today we’ll continue with another tutorial, this time about how to create a responsive Bootstrap 4 Carousel with Multiple Items. For this tutorial we’ll use one of the templates I mentioned above, which I’ve created using the Bootstrap carousel component. Also we’ll use Bootstrap version 4.2.1. And here is a LIVE DEMO. Before writing this tutorial I didn’t know how to create this type of carousel or slideshow. So with a few Google searches I found this discussion on stackoverflow. There I found this code, which was based on this, which was made by this company (thank you 😉 ). I took that code, customized it a bit to match the style of my template and, after some trial and error, I managed to create the carousel just as I wanted it and as we’re seeing in this guide. Ok, after this introduction, now let’s continue with the HTML code. The HTML code which you can find in the “index.html” file, is very simple as it’s similar to a “normal” Bootstrap carousel. The difference is that we use different columns for each image and different column sizes for each screen size (smartphones, tablets, desktops) to make it responsive. Read the Bootstrap grid documentation here to learn more or just to refresh your memory. I have divided the CSS code in 3 files for simplicity (“style.css”, “media-queries.css”, “carousel.css”) but you can merge them together in a production website to reduce HTTP requests and improve load time. You can find them in the folder “assets/css”. As the name suggests, the code that handles the carousel behaviour is in “carousel.css”. As I said above, I found it with a few Google searches and modified it for my template. The code in the other two files (“style.css” and “media-queries.css”) is for styling other parts of the template, not the carousel. I’ll not show it here, to keep the tutorial short. We use some Media Queries to display the various slides in different screen sizes. Here you can see the available Bootstrap carousel’s events. You can use these templates in personal and commercial projects (if not otherwise specified in the single files), but you can’t sell or distribute them directly, “as is”. If you plan to use them, a link to this page or any form of spreading the word will be much appreciated. That’s it! I hope you learned something new with this tutorial that you can use in your projects. The carousel we created shows 4 slides at a time in large (desktop) screens, but you can play and experiment with the code if you want to show a different number of slides. If you have any question or suggestion, let me know in the comments below. Carousel not working for number of items same or less then itemsPerSlide variable. Hi, this finally is a version that just works in all versions of Bootstrap 4. I’ve adapted it to use cards instead of just images, which gives a nice twist. What gets me though is that I ony need to show three items instead of four on large screens, but I cannot for the life of me figure out what the magic combination is to adapt your code to cater for that. Whichever way I tweak this I get that the next or previous slide is only loaded when the user clicks the previous/next buttons. In the above example it seems like the next/previous item is preloaded or something. Can you give a hin as to how to tweak the code to only show three instead of four to begin with? I.e. not the lg-3 option, but just start with md-4. The responsiveness shouldn’t change as the way it works now it is great. Last item doesnt loop back to first item.slide takes 3 more transition for the first item to show..
carousel not showing first element after the last element instead takes 3 more transition for the first one to show. help on this anyone?? ?